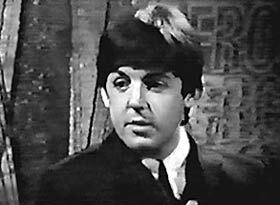 ABOUT THIS INTERVIEW: On April 15th 1964, Paul McCartney sat down with David Frost for a brief interview that would be telecast on May 18th as part of the BBC television program 'A Degree Of Frost.' The interview was conducted in front of a live studio audience. Frost and McCartney discuss songwriting, the Beatles ambitions, and their upcoming movie. At the time of this interview, the Beatles were just 2 weeks into shooting their first feature film, A Hard Day's Night. David Frost is considered the epitome of successful British television presenters. Beginning in 1962, the popularity of Frost's TV programs has continued through the years, showcasing him as the interviewer of high-profile political figures as well as pop icons. DAVID FROST: "Paul, it's great to have you here, and one thing that I've been wondering is whether you ever expected things to be as good for you as they have been. When you started as a group, did you expect things to go like this?" PAUL: "No. We used to sort of think of things in stages... still do I think. When we first started off, playing in the Cavern, I thought first of all 'Let's get a record contract.' We all did. When we got a record contract, we said 'Let's get a number one hit.' ...Got one of them." DAVID FROST: (laughs) "So I hear... yeah." PAUL: "So we do it in stages. So we never thought of it being this big." DAVID FROST: "After you got a number one hit, you hoped for another number one. Then what?" PAUL: "Umm, something like the Royal Variety performance. Something sort of big. Then... what came after that.... America, I think." DAVID FROST: "...which was marvelous." DAVID FROST: "It's fairly close to the film being as big of a success as everything else, I should think. Now if it is, a bit later this year, a big success... What will be the next ambition then?" PAUL: "I don't know. Another film probably." DAVID FROST: "And what about after that." PAUL: (jokingly) "Oh, don't ask me... I'm only doing it." DAVID FROST: "Have you got any ambitions in other spheres completely? I mean, do you want to be Prime Minister one day?" PAUL: (shakes head and laughs) "No! No, nothing like that. I'd like to... retire." DAVID FROST: "And when do you think you'll achieve that ambition?" PAUL: (jokingly) "The way things are going, about a couple of years or so." DAVID FROST: "When people usually ask you, 'What's the best thing about being one of The Beatles at this stage, you usually reply 'The money' as the first quip. But what after that is one of the good things?" PAUL: "Being able to do things that you enjoy doing. You get a bit of power when you, sort of, reach a certain stage. And then you can suggest things that you want to do. I mean, we can turn to Brian (Epstein) and say, could we do such-and-such a thing... like a film. And he'll say, 'Well, I'll try and fix it, boy.' He's good like that, you know." DAVID FROST: "So the power it gives you is the power to do what you want." PAUL: "Yes. So, rather than sort of being struggling unknowns and trying to do things that we'd never be able to do, we can now do more things that we'd like to. I think that's sort of a good part of it." DAVID FROST: "And when you write music... which you do a great deal with John Lennon... you write it very much, and marvelously, in the current idiom. Do you feel that later on, when you move into another period... say in five years time... you'll be writing in the same idiom? Or different? Will you change with the times?" PAUL "I think the point is, the tunes that we write..." (stumbles over his words) "...on, in, any iddum. Idiom." (looks at the audience) "Idiot..."
PAUL: (chuckles) "I think it's just the arrangements. For instance, 'From Me To You.' It could be done as an old Ragtime tune... especially the middle-eight. And so, we're not writing the tunes in any particular idiom. So, in five years time, we may arrange the tunes differently... but we'll probably write the same old rubbish!!" DAVID FROST: "How do you judge a good song when you've written it? PAUL: "By us liking it. You know, John and I. If we like it, then we think it's a 'good'n'. It's a combination of liking it... and what is commercial... what we think other people will like." DAVID FROST: "Can it be a good song if you like it and nobody was to buy it? That hasn't happened to you." PAUL: "It always is for us: If we like it. And in fact we don't like bad songs, that's all there is to it..."
DAVID FROST: "Of course, I imagine, everybody says to you that the Pop world is very short-lived... and 'What will you do when the phase passes.' Or 'Do you think the phase will pass?' Does it worry you?" PAUL: "No. I couldn't care less, really, if we flopped tomorrow. It'd be sad, you know... but it wouldn't really worry me." DAVID FROST: "Could you go back to doing something else?" PAUL: "I'd miss doing this. But I think I'd think of something else to do." DAVID FROST: "What would you like to do?" PAUL: "Write songs for other people." PAUL: "Completely different. Or... retire, you know." DAVID FROST: "Well, it will be a great pleasure to watch Paul McCartney in retirement, but it will probably be in the year about 2010 I should think."